According to the latest worldwide market study by International Data Corporation (IDC), 3.2 billion people, or 44 percent of the world's population, will have access to the Internet in 2016. More than 2 billion will be using mobile devices to do so. Growth in Internet access is taking place around the world, but some countries are seeing particularly rapid growth. 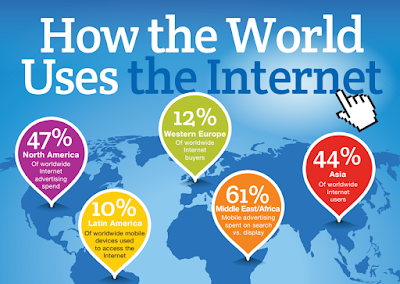 Furthermore, the world's Internet users are performing a variety of activities online. China, India and Indonesia lead the way -- they will account for almost half of the new user gains in Internet access globally over the course of the next five years. The combination of lower-cost mobile devices and inexpensive wireless networks are making accessibility easier in countries with large low-income populations that could not previously afford to use the Internet. The total number of mobile Internet users is forecast to rise by approximately 2 percent annually through 2020, unless significant new methods of accessing the Internet are introduced to accelerate growth. Google, SpaceX, and Facebook are attempting to make the Internet available to the remaining 4 billion people via high altitude planes, balloons, and satellites. However, it's unclear how successful these endeavors will be and when they will be operational at scale. "Over the next five years global growth in the number of people accessing the Internet exclusively through mobile devices will grow by more than 25 percent per year, while the amount of time we spend on them continues to increase," said Scott Strawn, program director at IDC. IDC believes that this change in the way we access the Internet is fueling explosive global growth in mobile commerce applications and also mobile advertising spend. Measuring what Internet users are doing online shows that many activities include billions of engaged people. For example, more than a billion people use the Internet to bank online, to stream music, and to find a job. More than two billion people use email and read news while online. And more people than ever before are making product and service purchases online. In 2015, more than $100 billion was be spent online in the following categories: travel, books, CDs and DVDs, downloading software apps, and online training classes. These purchases are enabled by online payment platforms that are making these transactions both easier and more secure. As more people spend greater amounts of time and money online -- increasingly through smartphones and media tablets -- savvy marketers are recognizing this trend and they're shifting their budget allocation.